Got a brilliant product that you think will make you the next millionaire? If so, you need to make sure that your product gets seen by all the right people when you launch, otherwise you can kiss your success goodbye. To knock your product launch out of the park, follow these five tips for ultimate success with your product. Before your launch date, you need to create some excitement over your product. To do this, you’ll need to start targeting people on social media 6-8 weeks before your official launch date to get them eager about your offering. Be sure to post something every couple of days to keep the news going and to entice new interested buyers. You should also approach influencers in your market who can encourage people to try your product once it launches and then write reviews once it has hit the market to attract more buyers. Another way to get a buzz going is to take pre-orders. Offer an incredible deal that people can’t resist to get sales started before you even launch. Don’t forget to contact industry analysts, radio stations, and local TV programs to set up a slot to launch your product through their channels. You’ll want to get airtime right after you launch your product, as well as every couple of weeks to stay top of mind and to attract new target customers who may not have yet heard about your product. This is a big one. You need to set relevant goals and regularly measure to see how you’re performing. This will allow you to prepare in advance for any sudden spikes in sales, and unexpected performance issues while staying true to your brand. Throwing a launch party is always a must. To throw a fun party that leads to more stales, be sure to start early by building up the anticipation of it by showcasing why people should attend. Do something a little unusual to get people intrigued and don’t forget to tell local media sources about it so you can pump even more life into your event. Remember to gather customer feedback right after you launch your product. This can give you insights into the areas you need to improve to make your product a success and to boost sales. Your launch party needs the right venue. One that has flexible space, a stunning design, professional staff, and onsite catering that will impress your guests. It’s also as equally import to set the right mood so that people can embrace your product and associate the brand with luxury and success. Come view our event space at St. Elias Conference Centre — we have everything you need to knock your product launch out of the park! After getting engaged, many couples tend to feel a surge of excitement followed by a boatload of stress as they begin to think about plans for their wedding. With so much to do and organize, it can feel overwhelming. But the key to staying calm and relaxed is figuring out one thing at a time, like when you’d like to host your wedding. 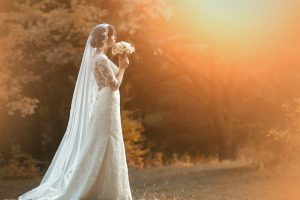 To help you determine if autumn is the best time for you, here are some pros and cons of hosting a fall wedding. The bright and bold palettes of colour that come with the changing of seasons are undeniably one of the most attractive features about hosting a fall wedding. With the combination of fiery red, orange, yellow, and everything in between, it can make your wedding look magical with a picturesque setting to help make your day even more memorable. The fall season is also usually a calmer time of year with regards to weather conditions. This is especially helpful when you don’t have to really think about battling the intense heat in the summer or the frigid cold temperatures in the winter. During this season, you have a much better chance of catching that sweet spot that’s perfect for your wedding day. When aiming for a wedding date around late October or early November, you can also take advantage of the lower prices from vendors. 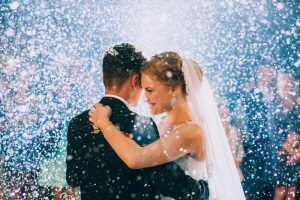 Since this season isn’t as popular for weddings, you can find much better rates on just about everything, including venues, caters, and more. Fall can also be a busy season for many different reasons — back to school, Thanksgiving, Halloween and more. So one of the cons to really consider before settling on your date is the potential conflict with timing. If you are planning on a hosting a fall wedding, we recommend keeping this point in mind and also sending out save-the-date cards well in advance. As pleasant as those autumn afternoons can be, this season can also be fairly unpredictable. Since it is a transitional season, you could potentially find yourself caught in a hot or cold spell with unfavourable weather. So always do your research to try and pinpoint a date that has the best record for being more favourable with the weather. This time of year can also be more limited with regard to the wedding theme and design. Settling on a fall date can place you into a pigeonhole of having a fall-themed wedding. Of course, this isn’t a problem if you love the idea of an autumn theme and palette. But if not, you may not have such a free range when it comes to your flower selection, outdoor setting, colour scheme and more. So keep in mind that it can be a challenge to get out of that pigeonhole. When you’re ready to plan your wedding, St. Elias Centre is here to help! Our award-winning venue, catering team, and in-house chef offer everything you need to celebrate your special day. Contact us today to speak to our coordinator or to arrange a visit to see in person what makes our space and service so impressive. If you want your event to be memorable, you need a luxurious and stylish venue. Discover stunning décor, fine dining, unparalleled customer service, and flexible design at St. Elias Centre. We have everything you need to make your next event a successful one. Pristine landscaping and an expansive lobby will greet your guests as they enter. The soaring ceilings and fabulous chandeliers will astound and impress. Whether you want an intimate indoor gathering or sunny outdoor/indoor wedding, we have the gorgeous backdrop and décor to create the perfect event. St. Elias features a modern, functional design with a sophisticated feel. With over 11,500 square feet of flexible hall space, our venue can accommodate every type of event imaginable. If you’re throwing a 1000 person gala, a 200 guest wedding, or a 50 person conference, we can assist. Our walls can be easily partitioned off to create the exact design concept and privacy that you desire. Our venue has been designed to offer our guests the highest level of comfort and convenience. Our private parking lot can accommodate over 400 cars so that your guests have easy access to the event. At St. Elias, we are dedicated to providing superior service for all of your needs. That’s why our venue comes complete with catering, bar service, and professional staff. We invite you to savour our menus created by our very own Executive Chef and to experience our white tablecloth service and delectable drinks from our fully stocked bar. Our staff are here to help make your event one to remember. They offer professional customer service that strictly adheres to your event plan, budget, and deadline. They’ll do whatever it takes to ensure that your event goes off without a hitch so you can sit back and enjoy. Whether you’re planning an intimate event or grandiose celebration, let St. Elias Centre make your event the highlight of the year. Our elegant and modern facility is the perfect place to throw events for your family, friends, or business no matter the time of year or time of day. When you’re ready to start planning, contact our team, and we’ll help you put together an event of a lifetime. Need to brush up on your not-so-great dance moves for an upcoming event or wedding? If you’re the type of person who secretly dreads those special occasions because of the dancing, we’re here to help! 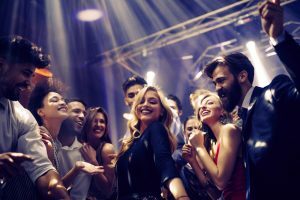 To help you strut your stuff at your next event, here are a few tips for how you can gain more confidence on the dance floor. Stop worrying so much about what others think. As humans, we spend way too much time and energy stressing about this, and in reality, most people really aren’t paying nearly as much attention as you think. So instead of worrying about looking silly while you bust out your dance moves, just focus on having fun. By switching your mindset and focus, you can lower your anxiety and loosen up, which will naturally help you look much more confident on the dance floor. Instead of bowing out on each dance, get up more often so you can allow yourself to practice more and even improve over time. Like everything, practice improves your ability to do something, even when it comes to social settings. By pushing yourself to get up and dance instead of shying away, you can build up your confidence while making new friends and even learning a few new dance moves. If your fear of dancing is something that really holds you back from attending events or enjoying yourself, then spend a little time and money on some lessons. At this stage, it’s worth it to invest a bit more in helping you get over this hurdle. Plus, life is short! You don’t want to be that person who looks back and wished they had gotten up more to dance. So book a few private lessons with a dance instructor to brush up on some social dance moves so you can gain more confidence when the next opportunity presents itself. When you’re looking for a good place to test out your new dance moves or just practise more, find a dance club that you can attend where you can just let loose and be yourself. You can go by yourself so that no one will know you, or you can bring along your trusted BFF that can get on the dance floor with you and lend you some support when you need it. Being able to bust out your new skills for a test run at a place where you can be anonymous may be just what you need to feel prepped and ready for any future dance-related event. If you’re in the process of organizing an event or even your wedding, St. Elias Centre can help you create a memorable, one-of-a-kind occasion with our spacious, multi-purpose facility. Hop onto our website to check out our venue and learn about all of our available features you need to host a successful event in Ottawa. When it comes to hosting any event, no matter the size, the devil is always in the details. And that goes for a book launch, too! Many authors nowadays can easily connect with their readers and audience virtually online. But it doesn’t eliminate the importance of connecting and sharing your work face-to-face with your readers at a book signing. 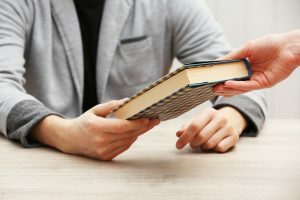 A book launch can be a daunting thing to organize, especially when you’re not always guaranteed to have a large turnout as a new or unknown author. That’s why organizing one can be more complex than many first-timers often realize. So help you boost your credibility and your turn out, here are a few ways to host a successful book launch. The venue that you select is a crucial factor for hosting a successful book launch. When you’re sifting through your potential locations, it’s important to keep a few factors in mind. You want to make it as easy as possible for your audience and attendees to get to your selected spot, so always consider the location and whether it’s accessible. Also, there should be ample parking available. You should also look for a multi-purpose venue where they can easily section of space to make it more suitable for your event size. There’s nothing worse than having an awkward, oversized area when you’re expecting a smaller crowd. These days, people are busier than ever, trying to juggle their work, family, and everything in between. And although you can’t always plan for unforeseen events, you can try to pinpoint a time during the week and day that will give you the best chance of getting people to attend. Start by mulling it over and narrow down the date and time for hosting your book launch. Then contact your venue of choice to determine if this is indeed available. It’s also a good idea to ask the venue for their opinion since this is what they are experienced at, so they may actually have a better idea of what time and day may work best. When deciding this, also keep your genre and type of audience in mind since this will factor in with their availability. A good general timeframe to fall back on is Sunday afternoons since most people tend to leave them more open. If you’re worried about the number of attendees, serving free food is always a great incentive to get people to show up. So ask if your venue will cater and serve food. This doesn’t have to be anything big and elaborate. Most good venues will offer in-house catering with menus that are suitable for lighter fare and smaller events such as this. Also, don’t forget to have some of your books on hand to sell at your book launch. If you only start to promote your event a week or so before the big date, chances are you won’t have a very good turn out. Start your promotions well in advance, at least a month before the launch. The more time you have to get the word out, the better chance you have at getting more people to attend. Make sure that on the day of the event, you arrive early to give yourself plenty of time to set up and get everything organized. There’s nothing worse than feeling rushed on an important day, so save yourself the added stress by giving yourself enough time, so you don’t have to rush. At St. Elias Centre, we can help you create a smooth and successful book launch. Our multi-purpose venue in Ottawa can be adjusted to suit your event. Plus, we offer plenty of parking and in-house catering provided by our award-winning staff and executive chef. Contact us today to learn more about how we can help you host your upcoming book launch. Organizing a tradeshow can be challenging due to the complex nature of the event. There are many things to plan for that are crucial to the entire operation. But by following this short checklist, you and your company can have the foundation you need to run a smooth tradeshow. Of course, a tradeshow isn’t an event without attendees. In order to get sellers and buyers to attend your event, you need to get the word out to everyone in the industry. Ideally, you’ll want to come up with a detailed marketing plan to promote the tradeshow on your website, social media, and in your local media sources. You’ll also need a sales kit to market your event to the vendor to show them why they should participate. To create a buzz, you should offer some sort of incentive to both vendors and buyers that will get them excited for your event, like providing a professional designer to improve their booth and an early bird discount. Timing is everything. If you pick the wrong time of year or a date that coincides with another major tradeshow, your event will suffer. You need to time your event perfectly to motivate attendees to reserve space at your tradeshow and to attract the most amount of people to your event. 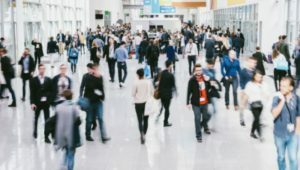 Even if there are no other trade shows scheduled on the same week as yours, you’re still be competing with other event organizers for people’s time and energy, so plan accordingly. Save yourself the effort and use a staffing company for your tradeshow. If you’re short on staff during the big day, it could lead to all sorts of problems. To make matters worse, you’ll be too busy to deal with a staffing shortage. So hire someone who can take care of all the staff hiring and training for you. To make sure your tradeshow goes off without any disasters, you need to be prepared for everything. That’s why you need to have a backup plan that will provide solutions to problems as they arise. The easiest way to do this is to do some research on the most significant issues that have occurred during tradeshows in the past and then create a solution for each one. You could also write on forums and online groups to ask other event planners what issues they’ve experienced and how they solved them. That way if anything does happen, you’ll have any unfortunate situations covered, saving you and all the staff a whole lot of stress. Most importantly, to run a smooth tradeshow, you need to pick a suitable venue. One that can handle all the electrical needs for running power to each and every booth, internet access for hundreds of people, and enough space for your floor plan design. It can be very convenient to find a venue that can help you take care of the food and drink, provide a customizable space, and help you with some of the logistics. And that’s where we come in! At St. Elias Centre, our professional team can provide everything you need for your tradeshow. With over 11,500 square feet of divisible event space, a spacious lobby, in-house catering and banquet services, high-speed internet, over 400 parking spots, along with exceptional customer service, we’re the perfect venue for your tradeshow needs! Have a big presentation coming up and feeling a little uneasy about it? Those anxious nerves and thoughts of self-doubt are perfectly healthy. But if you want to crush your performance, you need to find a way to stop these negative emotions from coming over you and figure out how to use them to your advantage. Here we’ll show you how you can step up, make an impression and nail your big presentation. 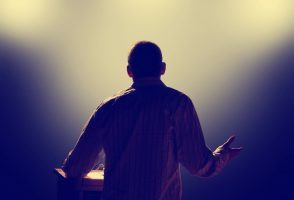 When you take the stage, all eyes are on you, which can leave you feeling a little insecure and anxious. Rule number one — don’t show it. Take ten deep breaths before you head up on stage to help calm your mind and body and improve your focus and clarify. Then step up and take control. Even if you don’t feel particularly confident at first, fake it — stand tall, make eye contact, use hand gestures, and speak loud and clear. 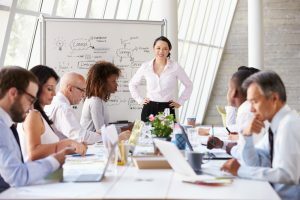 The first thing people will notice is your body language, so exude confidence and clarity when you’re delivering a presentation, and people will believe it. It’s not just what you say; it’s how you look. Make sure you dress the part if you want to nail your big presentation. That means iron your outfit, style your hair, shine your shoes, and look like you’re about to receive an award on stage. Your presentation needs to engage and delight your audience, or they’ll quickly lose interest. Know your audience and then make sure your presentation delivers something engaging and informative. Nobody wants to listen to a presentation from someone who isn’t passionate about the topic. Put a little energy and excitement into your presentation, but don’t go over the top. Aim for charismatic, outgoing, entertaining and imaginative, but leave dull, fidgety and hyper backstage. The more you prepare and practice, the less likely you’ll get nervous and forget what you’re supposed to say. That’s why you need to come prepared to deliver. 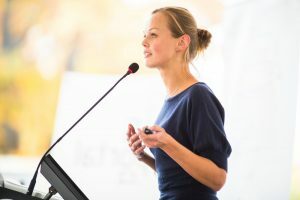 Don’t just draft up a presentation and speech and expect it to go smoothly. Practice it at least five times from beginning to end. If you have a spouse or business partner, make sure to practice it in front of them so they can help make suggestions regarding your tone and delivery. You should also have all the presentation requirements organized with the event planners at the venue. If you need AV, lights, sound, and a screen for your presentation, make sure its all planned for and tested in advance to prevent a disaster. You’ll be happy you did. At St. Elias Centre, we have everything you need to nail your big presentation. Our modern multi-purpose event centre has a full-sized theatre stage, podium, and can accommodate any type of AV and light equipment necessary. We also have friendly on-site support who can help you set up so that your presentation goes smoothly. To find out more about our venue, contact us today. 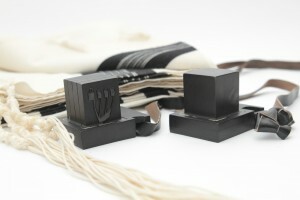 Are you gearing up for your bat or bar mitzvah? Mazel Tov! This is a significant milestone for you and your parents. And, since it’s a once in a lifetime event, there’s no better reason to go all out and make it a big celebration where you and your family and friends can have a blast. 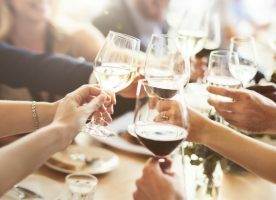 So if you’re in the midst of planning out your celebration, here are a few good reasons why you should make it an event that you’ll remember for a lifetime. When it’s time to celebrate a coming of age milestone such as this, why not take full advantage and make it an occasion that you and everyone involved can let loose and have some fun? Whenever there’s a reason to have a meaningful celebration, we say go big and make the most of it! Aside from wedding, your bar mitzvah is one of the most significant events that you’ll get to experience in your life, so do it up! Get involved with your parents, ask them questions, and contribute to how your celebration will unfold. Make it just a special as you want and hope for it to be. The best part about your bar mitzvah is that it’s all about you! You’re the star of the show, with all eyes on you. So enjoy the limelight as much as you can. Talk to your parents about contributing to the decisions like the theme, the menu, and how it can suit your personality best. Even if you don’t enjoy the idea of having so much attention, this should be something that you discuss with your parents as well so they can arrange the party in such a way where everyone can enjoy it (without making you feel too embarrassed or uncomfortable). Every bat and bar mitzvah celebration is unique from the next, so don’t be scared to do something different! Celebrating your coming of age is a big deal, and it’s one of the most memorable occasions you’ll get to experience where all eyes are focused on you. So take advantage and go all out for your bar mitzvah! At St. Elias Centre, we have the perfect space to make your event incredible. We offer an elegant venue with shimmering chandeliers, and luxury, modern décor. Whether you plan for a big celebration or an intimate one, our facility can accommodate. We also have own in-house executive chef that provides nothing but fresh, high-quality, mouth-watering culinary experiences. So when you’re looking to create a memorable, one-of-a-kind bar mitzvah, we can help! Contact us today.